Bed Bug Treatment for Your Raleigh-Durham, NC Home - Capital Pest Services, Inc. If it’s one thing many of our customers in Raleigh, Durham, Chapel Hill, Apex, Morrisville and the Triangle have been talking about recently, it’s bed bug control. Recent news reports have stated that the need for a reliable bed bug exterminator is more important than ever, given their resurgence in cities and towns all across the country. Capital Pest Services is your Raleigh-Durham, NC leader in bed bug treatment and bed bug inspection services. 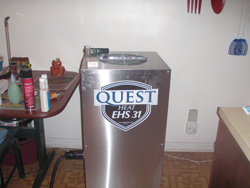 We utilize the latest in family and environmentally-friendly solutions to getting rid of bed bugs—fast! Our bed bug treatment process is a multi-step approach that identifies the extent of your bed bug infestation and then takes proven, effective steps that eliminate them and help prevent bed bugs from coming back to your home. Heat kills all life cycles from eggs to adult insects. Bed Bug Inspection: From one of our trained technicians or a bed bug canine, we’ll find them wherever they are in your home or office. 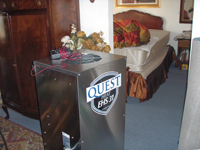 Heat Treatment: Our bed bug heat treatment can cover the entire house, commercial space, or only areas where bed bugs are found. The high heat and low humidity conditions cause these pests to die due to lack of moisture, usually within minutes. All life cycles from eggs to adult insects are destroyed. Follow Up: Our trained technicians will perform a post-heat-treatment bed bug inspection to ensure that we’ve eliminated the infestation from your home. Prevention: We give you the latest information on how to prevent a future bed bug infestation and recognize bed bug bites at home or when you travel. All bed bug services require purchase mattress encasement on your own or through Capital Pest Services or local retail store. To find out more about our bed bug treatment options, call us at (919) 847-8110 or contact us online for an estimate from the Capital Pest customer service team. Call now!